My students were wondering if they were ever going to learn how to kick. Well, here it is ... the front kick. We've been stretching and strengthening their legs in the last half a year. Drilling the knee kicks. Now we're using all of this to drive that front kick with a powerful hip motion. You may not see it in the picture above (I ripped it from the net), but the front kick is driven off by the hip. We trained using a back balance, bringing up the leg in a chambered position, kicking and pushing the hips out, striking with a rigid foot, flexed out to hit with the ball of the foot, and then snapped back into the chambered position. Breath is the same as with a hand strike - it starts as the technique starts, goes until the muscles are locked into a 'kime', and then relaxed as the technique is retracted along the same line. Anything else I missed for beginners? Um... how about target height? Where are they kicking? Last session we practiced front kicks with the orange belts. Human targets had to stand there getting kicked in the side of the gut (obliques), holding out a horizontal forearm just under belt height -> one fist away from their bodies. 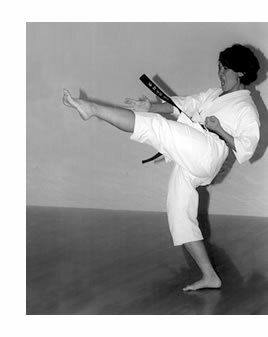 The kicker had to fit their foot between this space, continue the upward motion and then snap the foot horizontal - punching the ball of the foot into the obliques. This helps to improve timing and coordination.